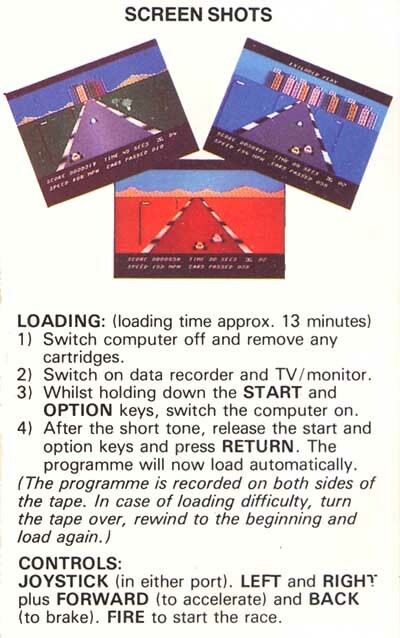 It looks like the Atari version of the coin-op game "Turbo" (http://www.ilovethe80s.com/turbo.gif). A shame I didn't know this game when I had my Atari 800XL. For reasons I can't put my finger on, I always liked this game. On paper it doesn't sound promising. The road is straight (no curves), and gameplay basically consists of dodging oncoming cars. Graphics are quite simple and buildings and trees move in a jerky/pattern-cycled fashion, with abrupt scenery changes. In fact, it's almost identical to the Commodore 16/Plus 4 original. Yet somehow, the graphics have a kind of charm to them and the gameplay is good fun (and you can go forever if you get good- my brother reached 1,000,000 points after playing for hours and had to stop for lunch). 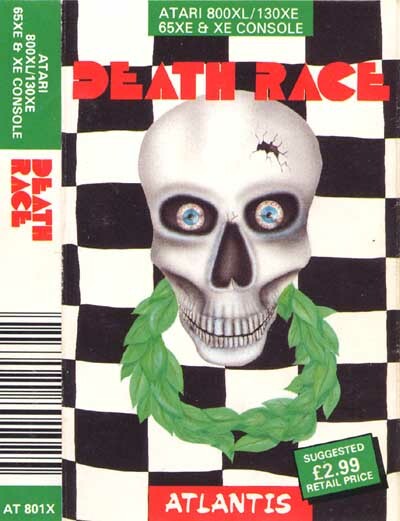 Intended as a TURBO port for the Atari 8Bit, Death Race would have greatly benefited from more development time. The seeds are right but the execution lacks polish and especially 'panache' as the gameplay rarely gets you into an enthusiastic mood (unlike Pole Position which literally makes you an addict). What's good ? The different backdrops used in the game are a nice idea which was rarely implemented at the time (probably only The Great American Cross Country Race did it but Pole Position and Pitstop II didn't due to memory space). To make a long story short, Death Race has some "moments" but they're too far and between to make it a pleasurable experience. It's worth a curious look but not much more.